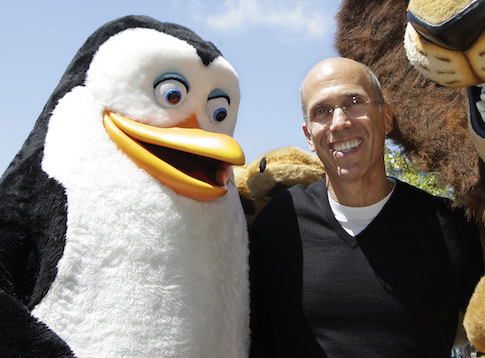 Low box office numbers for Dreamworks Animation's Penguins of Madagascar is the latest in troubles for Obama donor Jeffrey Katzenberg, who has unsuccessfully been shopping the studio all year. Shares of Dreamworks Animation fell more than 5% in trading Monday after audiences gave the movie studio’s latest release, Penguins of Madagascar, a chilly reception at the box office. Dreamworks Animation needed a strong performance from Penguins to restore investor confidence after taking write-downs on three of its last five releases. But instead, the movie grossed only $36 million at the domestic box office over the four-day Thanksgiving holiday weekend, well below analysts’ expectations. Most analysts who follow the studio had expected Penguins, which is a spin-off of the highly lucrative Madagascar franchise, to generate between $45 million and $55 million over its opening weekend. Analysts are divided over whether Dreamworks Animation will have to book a loss on Penguins, in part because of its strong performance in international markets, particularly China. The movie has taken in $62.6 million since its Nov. 14 opening internationally, with $24 million of that amount coming from China, by far the most of any country outside of the U.S. Between foreign markets and the U.S., Penguins has thus far grossed $98.6 million.